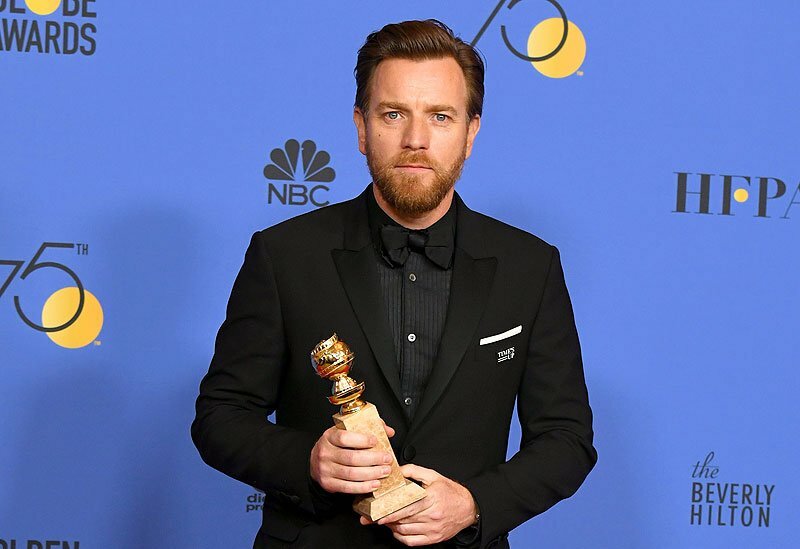 After winning a Best Actor in a Limited Series Golden Globe last night for Fargo, Ewan McGregor talked to reporters about possibly returning to a galaxy far far away again for the Obi-Wan Kenobi spin-off film. While that’s pretty much McGregor’s standard line regarding the project, certain things may speak louder than words. For instance, that distinctive beard the actor is growing out? Also, the fact that he’s currently doing kenpo training with fitness guru Tony Horton? But does all this add up to Ewan McGregor playing Obi-Wan? A December report from Omega Underground had the Obi-Wan Star Wars Story shooting at England’s Pinewood Studios starting January 2019 for a late 2020 release, freeing up summer 2019 for Lucasfilm’s Kathleen Kennedy to oversee Steven Spielberg’s Indiana Jones 5. So would McGregor really be growing out his beard and doing martial arts training for a movie that doesn’t shoot for another year? The actor is actually currently shooting the Winnie-the-Pooh fantasy Christopher Robin for Disney, so the beard could be for that film. It’s also possible that McGregor could be pulling double duty in not only an Obi-Wan standalone but also as a Force ghost in J.J. Abrams’ Star Wars: Episode IX, which is expected to shoot in June of this year. If he’s training for Abrams’ film and not just for funsies, then fans could finally see Force ghosts doing battle, something that’s been a possibility since early development on Return of the Jedi and was even brainstormed for The Last Jedi (see our recent 10 Scrapped Ideas from Star Wars: The Last Jedi piece). Stephen Daldry (Billy Elliot, The Hours, The Reader) had previously been announced as in talks to helm the Obi-Wan feature and oversee script development. What fans have especially been eager for, however, is that Ewan McGregor would reprise as the character, having played him in Episodes 1, 2, and 3 of the franchise. As the Skywalker family story continues to be told in the episodic films of Star Wars, Lucasfilm has sought to fill in the gaps of events in the franchise and tell origin stories with their standalone movies. The first “Star Wars Story” was last year’s Rogue One, which pieced together just how the Rebels were able to get the Death Star plans during the events of Star Wars. The next standalone feature will be Solo: A Star Wars Story, which has Ron Howard directing, after replacing Phil Lord and Chris Miller. It has also been previously reported that Lucasfilm is interested in Yoda and Boba Fett-centric movies. What would you want to see in an Obi-Wan movie? Sound off in the comments below!